To commemorate the historic event of the encounter between St. Francis with the Sultan of Egypt, AL-Kamil in the year 1219, modernize it in today’s Pakistan, launching a universal message of tolerance, friendship, dialogue, common commitment for peace: in this spirit the National Commission for Interreligious Dialogue and Ecumenism, within the Conference of Catholic Bishops of Pakistan, organized a meeting to inaugurate the activities that, in 2019, will commemorate the event in Pakistan 800 years ago, in the name of Islamic-Christian dialogue. 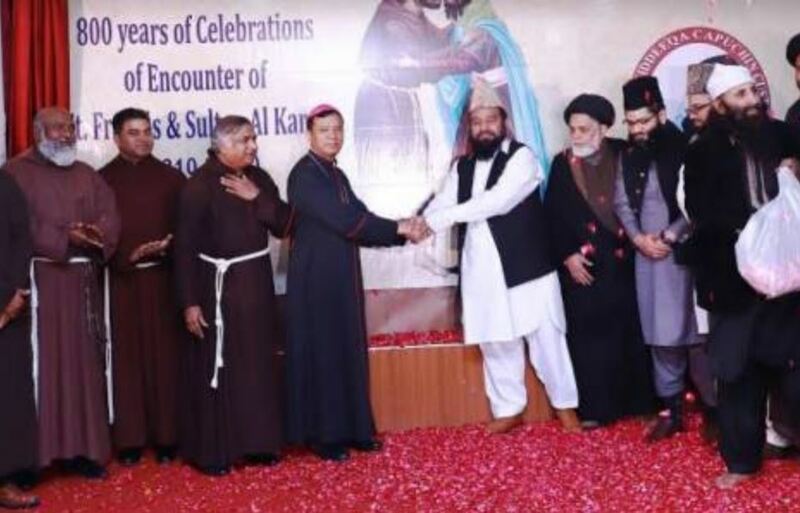 As Agenzia Fides reported January 15, 2019, Franciscan Sebastian Shaw, Archbishop of Lahore and President of the Commission, presided over the ceremony, held on January 12 in Lahore. Next to him, there was Fr. Francis Nadeem, Custodian of the Capuchin Friars in Pakistan, Executive Secretary of the Commission. Numerous Franciscans, nuns, priests, lay people, and eminent Muslim scholars arrived in Lahore for the occasion also from Sialkot, Gujranwala, and Islamabad. The two great leaders, Francis and Al-Kamil, “spoke up for peace and tolerance amid the atmosphere of war and conflict during the crusades. They gave an example of interreligious dialogue and mutual understanding”, said Fr. Nadeem. At the beginning of the ceremony, a painting was unveiled that depicts the encounter between St. Francis of Assisi and Al-Kamil, while the doves were released in flight, symbolizing the hope of spreading the message of peace in Pakistan and especially in the areas in which there are religious and political conflicts. Fr. Nadeem announced that in 2019 the event will be celebrated throughout Pakistan, with various activities: seminars for children, young people, university students, always involving Christians and Muslims. “We also intend to reach 30% of Muslim religious leaders who are hostile to Christians, like St. Francis, fearlessly, with the help of Muslims who are on our side, we wish to meet them to promote peace and harmony in Pakistan”, he said. Maulana Muhammad Asim Makhdoom, a well-known scholar among the many Islamic leaders present, agreed: “We will promote together the mission of St. Francis and the Sultan. It is up to us to face those who spread hatred and prejudice among religions. We have to commit ourselves seriously this year in order to convince other people to join this movement that promotes interreligious dialogue, peace, and social harmony as we celebrate the 800 years of that historic encounter.” The ceremony ended with the common prayer for peace recited together by the assembly.